What can I say? Not only was Guardians of the Galaxy a wickedly awesome film, but the music featured in it was equally as amazing. Part of the reason I liked the movie so much was the soundtrack – it showcased some really great songs from the late 60s and the 70s, songs that are not only feel-good tracks, but also just good songs. I love that director James Gunn decided to utilize older music because one, I am incredibly bias in that I adore oldies, and two, (more importantly) that it introduced a younger generation to some great music and artists that they perhaps had never heard or even considered before seeing the movie. Guardians of the Galaxy gave oldies a chance to shine, and shine they did. James Gunn revealed that he decided to use the older music because those would have been the songs that the movie’s protagonist, Peter Quill (aka Star Lord), would have listened to on his Walkman while a child living on Earth. This song is so catchy! I remember when I heard this song for the first time. I was in the car with my father while on one of our thrift store shopping days, we look for old vinyl records (I may or may not have a slight hording problem when it comes to records), when this song came on the radio. My dad instantly smiled and turned the volume up, bobbing his head to the ooga-chachas at the beginning. I couldn’t help but smile at his reaction and I in turn came to love the song. I think one of my favourite things about it is that it just makes me grin, whether it is whilst trying to sing along to the ooga-chachas or happy feel of the music in general. Fun Fact: Hooked On A Feeling was originally recorded by B.J. Thomas in 1968. His version actually featured a lyrical reference to drugs, which was tweaked when Blue Swede later recorded it in 1974. Bonus Fun Fact: Blue Swede (pronounced like the fabric ‘suede’) is actually a Swedish band, thus the use of the ‘w’ in the band’s name. I am going to be frank – I didn’t really know this song until I heard in Guardians of the Galaxy. But, after having seen the film, and speedily downloading the soundtrack, I have a new appreciation for this track. It has a nice blend of a more pop chorus with that classic 70s rock feel. The guitar at the beginning paired with the lead vocals rock my socks. And speaking of the lead vocal, Eric Carmen’s voice is something to behold (ear wise). He has a smoothness to his voice that makes it seem so effortless. Fun Fact: Because of the sexually suggestive lyrics of Go All the Way, the song was considered too risky and was banned by the BBC in Britain. Bonus Fun Fact: The repeat of the words “come one,” are a loose reference to the “come on’s” sung by the Beatles in their song Please Please Me. This song is one that I almost instinctively think of when I think of the 1960s, even though it came out on the tail end of the decade, 1969. The first time I actually remember hearing this song was on an infomercial for a CD collection of music from the 1960s. I like this song because it has a nice guitar part, good vocals, and a nice complement of backing vocals. With concern to the guitar, my favourite parts are when the guitar does a fall, the descending notes ringing like the old sound effects used in cartoons for when a character falls a great distance (aka: Wile E. Coyote). Fun Fact: The song sold two million copies in the United States from 1969 to 1970. Bonus Fun Fact: Spirit In The Sky is used to introduce the starting lineup of the Los Angeles Angels of Anaheim for home games at Angel Stadium. This is another track that I was unfamiliar with until seeing the movie. But, you can now find in on my IPod. This song is definitely worth a download. Not only is it sung by the wickedly talented (and awesome!) David Bowie, but it talks about space and ray guns and all kinds of other goodies! It also has a nice guitar feature towards the song’s end. Fun Fact: Moonage Daydream was originally recorded by a band known as the Arnold Corns (which I read the first time as acorns – clever, Arnold Corns, clever). Extra Bonus Fun Fact: Including David Bowie, Moonage Daydream has been recorded by 33 other artists. Let me just say that every time I read Elvin Bishop’s name, I hear Elvis Bishop in my head. Anyway, back to the song. Fooled Around And Fell In Love is definitely one of my favourite songs from the 1970s and from the Guardians of the Galaxy soundtrack. For starters, the lyrics are brilliant – I love songs that tell a story and this one definitely does. Second, the lead vocals, done by Mickey Thomas, are to die for. His runs and wails are just brilliant and make me jealous. Thirdly, te guitar solo performed by Elvin Bishop. It has a soul, blues feel that undoes me. Lastly, the song, in my opinion, has a nice balance of chorus and verse. Fun Fact: The lead vocals, despite popular belief, are not sung by Elvin Bishop. He believed his voice was too gravelly and wouldn’t do the song justice. So, Mickey Thomas was invited to sing the lead. Bonus Fun Fact: Fooled Around And Fell In Love has been featured in several films, including Boogie Nights, The Family Stone, and Harold & Kumar Escape from Guantanamo Bay. This is the final track that I didn’t know until I saw Guardians of the Galaxy. I had heard it on the radio before, but I had never really paid much attention to it. Having downloaded it, I have come to realize I was overlooking a really great song, and a really fantastic band. I am proud to say that I now own two or three vinyl records from 10CC , and each have been delightful. The lead vocals with the subtle compliment of backing vocals are my favourite thing about this track. Bonus Fun Fact: I’m Not In Love is featured on the soundtrack for the video game Grand Theft Auto: Vice City Stories (this fact made me both laugh and do a double-take). Let me just start by saying DANCING BABY GROOT. The scene in which this song is used is possibly my favourite from the whole movie. I mean who doesn’t love an adorable little dancing tree that can only manage three words? But in all seriousness, I Want You Back is a great feel-good song. The vocals from a young Michael Jackson are on spot and the music is a nice balance of funk and pop. 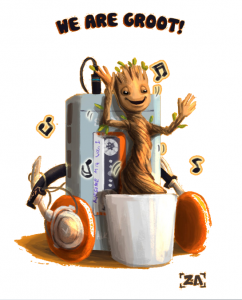 Baby Groot knows what’s up – this is definitely one to dance to. Fun Fact: I Want You Back was performed by the Jackson 5 during all of their world tours. Bonus Fun Fact: I Want You Back was inducted to the Grammy Hall of Fame in 1999. SUPER FUN FACT: Here is a link to dancing baby Groot. Why? I think you mean, why not? I LOVE THIS SONG SO MUCH! This song is most undeniably one of my all-time favs. It is fun to listen to, to sing to, and it makes me want to get up and dance every time it graces my ears. I can’t really place my finger on just what it is that makes me like it so much, be it the funky guitar or the amazing vocals, but I highly recommend this track to anyone and everyone. Fun Fact: The song’s band, Redbone¸ is actually a Native American rock band. Bonus Fun Fact: That last fun fact BLEW MY MIND. Fun Fact: Cherry Bomb is used in the cult classic film Dazed and Confused, which came out in 1993. Bonus Fun Fact: Cherry Bomb was covered by both Dakota Fanning and Kristen Stewart for the biographical The Runaways, based off of the band, which came out in 2010. The first time I took notice of this song, as funny as it sounds, was during marching band practise in high school. The tuba section would, between running drill, randomly break into this song, bellowing out the lyrics while dancing with sousaphones (it was quite the sight to see). After they did this a few times, I finally decided I needed to know what the song was that they were singing. And so it came to be that I would fall in love with the Pina Colada Song. This song has two things that I dearly love, great lead vocals and it tells a story. The story part is my favourite part of this song. When I first listened to it, I was saddened by the words, but by the time the song reached its conclusion I was nothing but smiles. The story it tells is one that you want to hear the solution to and when you do, it leaves you satisfied and smiling. Fun Fact: This was the last #1 hit in the United States for the 1970s – it came out in 1979. Bonus Fun Fact: The original title of the song was only Escape, but was later changed because it was often overlooked more popularly referenced to The Pina Colada Song. Rupert Holmes reluctantly consented to add The Pina Colada Song in parentheses to the song’s one word title. Now, this makes me feel so old, but I first heard this song in the 2007 film Bridge to Terabithia (which seems like it came out a century ago). In the film, Zooey Deschanel plays a music teacher and sings the song with her students. After hearing it in that movie, O-o-h Child disappeared a while for me. I only rediscovered it when I was later on the hunt for new soul tunes. The aspects I love about this song are the trumpet parts, the smooth vocals, and the message of the lyrics. This song always makes me feel better, especially when I am maybe not having the best of weeks. But, my favourite part of this song is definitely about halfway through when it goes from a rather mild sound to a more full, exciting sound (with the entrance of the backing vocals and more instruments). Fun Fact: The members of the song’s band, The Five Stairsteps, are all siblings. This song speaks for itself – it is an absolutely amazing track! It is just one of those songs that everyone knows and that no one can resist the urge to sing to. The first time I heard it was while watching Remember the Titans. (Let me just say that I am most definitely not a ‘sports person,’ but this movie is a amazing! The music, the story, gah! Everything about it is awesome.) It was the locker room scene, where the team just starts singing and dancing to the song – it made me smile so wide. Bonus Fun Fact: Ain’t No Mountain High Enough was later recorded by The Temptations, the Supremes, and Diana Ross. The soundtrack for Guardians of the Galaxy was, in my opinion, the best of 2014. No, it didn’t feature brand new tracks from fresh artists, but it did feature great songs from one of best eras in music. It used songs that have amazing guitar, smooth vocals, songs that tell stories. It used songs from a previous decade, opening up a whole new world of songs and artists to a younger generation and bringing back memories for those who played these songs on their vinyls and Walkmans, much like Peter Quill. Hi! My name is Hannah Blevins and I am the programming director for KHDX. I am an avid fan and collector of oldies music and my show is Throwback Thursday, where I play hits from the 1920’s up to the 1990’s.